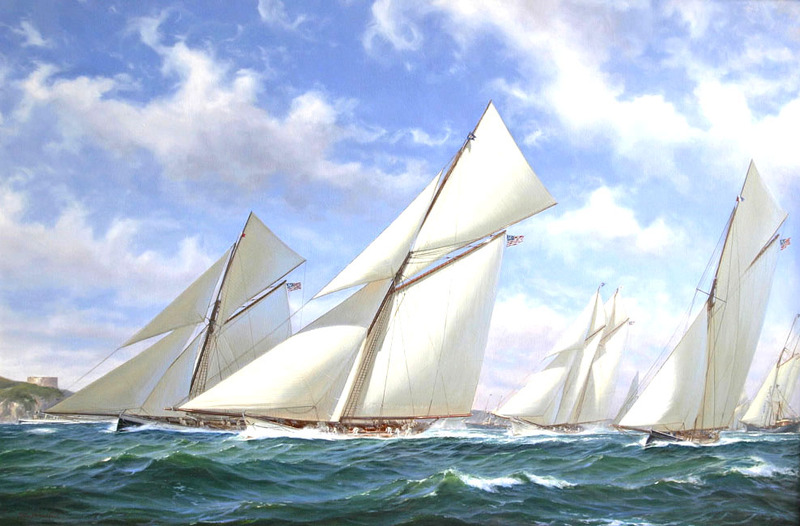 In the principle competition to see which yachts would become the leading contenders to defend the America's Cup each season, the Goelet Cup Races off Newport Road Island were an annual event of the New York Yacht Club and invited competitors. The first was held in 1882, and they raced for a perpetual trophy held by the Club, and annual custom trophy cups designed by Tiffany & Co. of New York with a $1,000 prize for the winning sloop and schooner. The 1887 race saw a large fleet sail the race. Here, STILETTO, PURITAN, VOLUNTEER, AMERICA, MISCHIEF, NORSEMAN and ELECTRA break the starting line between Fort Adams and the aptly named �Dumpling Rock� of Newport Harbor. VOLUNTEER proved to be the class yacht of the race and 1887 in her maiden season, winning the race by more than 8 minutes and losing only one match the entire year. Shane Couch's historic research is a strong asset to what may only be labeled a superb artistic painting. Technically precise, his yachts hold all of their design excellence and grace, while noting if found wanting in the sea and sky atmosphere. VOLUNTEER won the right to defend the America's Cup in 1887 by defeating a Boston syndicate's MAYFLOWER and proved a good choice, as she handily defeated the English Challenger THISTLE in the series over the New York Yacht Club's harbor and outer courses off Sandy Hook. She and her contemporaries are well remembered herein.